CEREV has partnered with the Montreal Institute for Genocide and Human Rights Studies, Centre for Oral History and Digital Storytelling, Concordia University Department of History, Concordia Department of Art History, Christie’s, the Alex Dworkin Foundation, McCord Museum, Montreal Holocaust Memorial Centre, Musée des Beaux-Arts de Montréal, Sotheby’s and the Government of Canada to present “Plundered Cultures, Stolen Heritage: A Conference on the Targeting of Culture During Mass Atrocities” on November 6 and 7, 2013. Please visit the event page for more information or to register. The very existence of national groups—their history, their memory and their future—rests on their members right to life, but scholars sometimes pay too little attention to assaults on the cultural identities of such groups which often precede physical attacks. “Plundered Cultures, Stolen Heritage”— Concordia University’s contribution to Canada’s year of Holocaust Remembrance leadership— begins the task of filling that gap and integrating our knowledge. 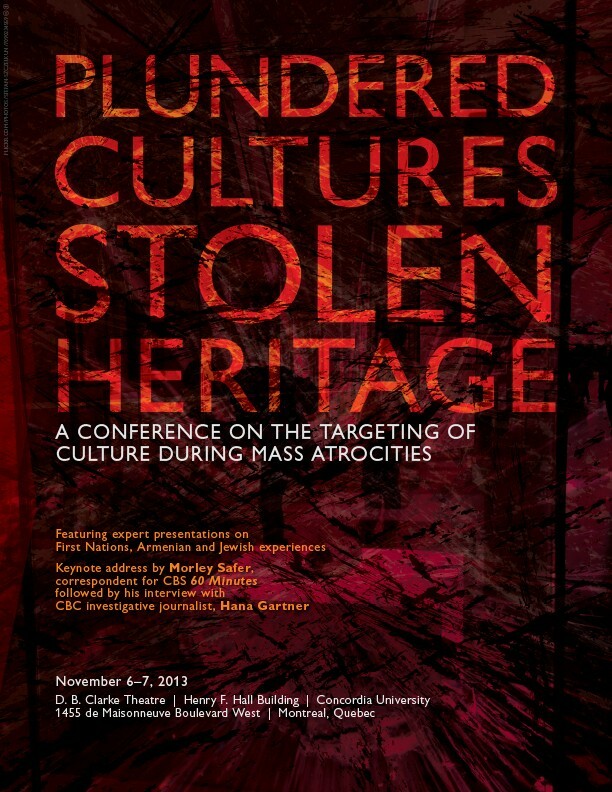 On 6 and 7 November 2013, leading experts on the experiences of cultural destruction and mass atrocities suffered by the First Nations, Armenian and Jewish peoples are assembling to discuss the motives of the perpetrators of these assaults, their impact, and the significance these attacks pose for restitution and reconciliation today. “Plundered Cultures, Stolen Heritage” opens a key chapter in multidisciplinary human rights studies integrating research on history, cultural studies and the memory of atrocity. Rather than a competition of suffering between groups, it signifies the determination of scholars to learn from the shared experiences of First Nations, Armenian and Jewish groups for the sake of all groups confronting crimes against humanity and genocides intended to destroy their national existence. CEREV fellow Monica Patterson will chair Panel 2, “Impact on the Victims,” on November 7 from 11:20 AM to 12:45 PM. Enter your email address to subscribe to CEREV and receive notifications of new posts by email.